Moda Fabrics: Honeysweet by Fig Tree & Co. This is the final reveal of the fall collection. Zip to it is a fun booklet with 4 different accessories in it. I developed a really neat ruching technique that uses pre-cut 2 1/2" wide strips. It is a great way to showcase lots of prints in a collection. 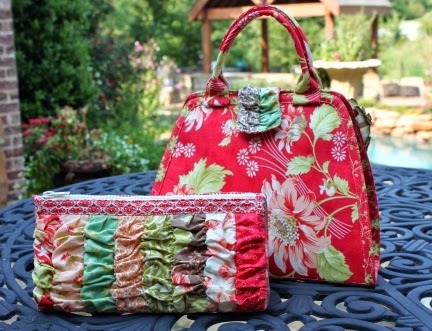 I also used some yardage from the collection to make up the rest of the fabrics needed to complete the projects. 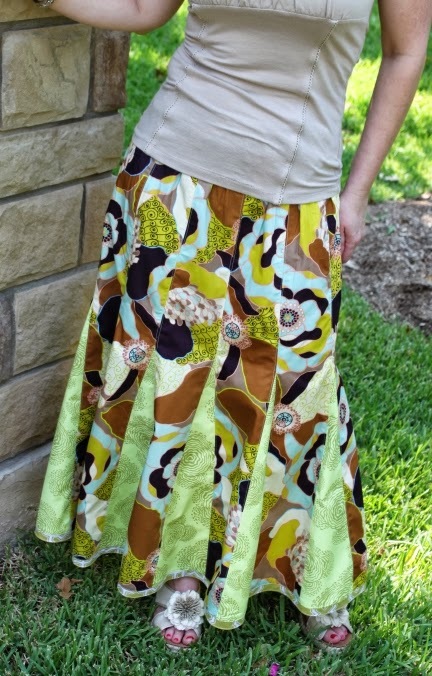 In addition to the ruching technique, I also wanted each project to have a zipper in one way or another. I know a lot of you out there hate the idea of putting in a zipper, but really, these are EASY to do! The booklet comes complete with a pull out center page that features full sized pattern templates. You will need to trace then onto freezer paper, but there is no enlarging to be done. The accessories are very versatile. While I had specific uses in mind, certainly you will think of many ways they can be used. 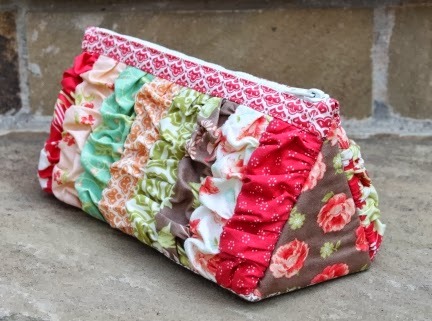 First up is the Hexie Pouch. 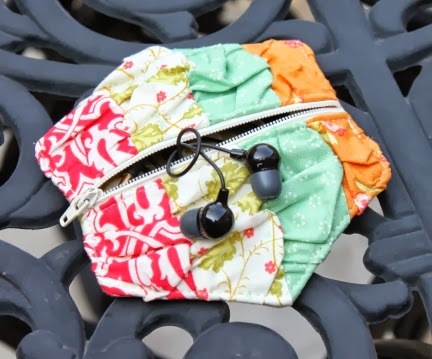 I designed this one for keeping your earbuds secure while out and about, but I can see how this little pouch would be perfect for loose change or other small items. I designed it to work with the pre-cut hexagons, so feel free to use those if you like. Next is the Tablet Sleeve. I designed this one to fit the ever popular tablet computers. Specifically, it works well for the Microsoft Surface and iPad, but I am sure it would work for most without having to resize it. Its overall measurements are 8 1/2" x 12". It features two exterior pockets of varying depth that are separate from one another so that you can stash different items like keys, a phone, glasses, etc. 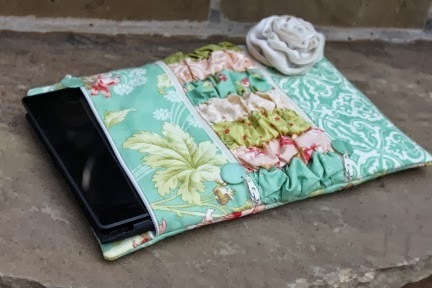 in those while keeping the innermost pocket free for your tablet. The tablet section is lined with a super soft flannel so your computer will not get scratched. I think this is a perfect cover for your tablet just to carry around or to put into a larger bag. The Triangle Bag is the next project. This is where the ruching really shines. 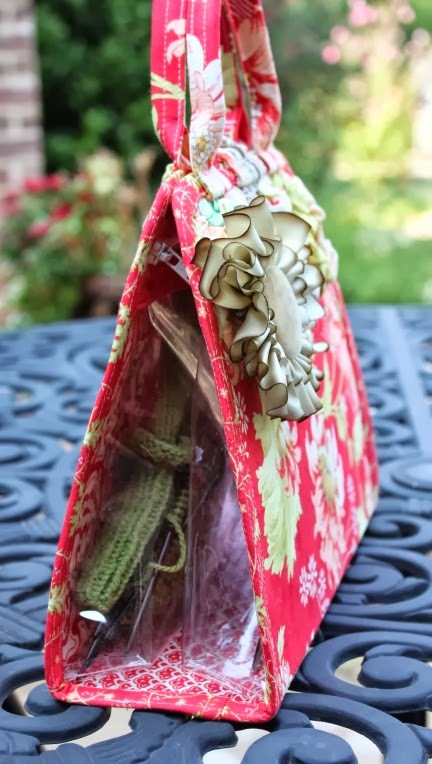 This is a perfect little bag for stashing art or sewing supplies. It would make a great little toy stash for kids as well. The last accessory is the Project Portfolio. It looks like a bag from the outside, but when opened, it features two clear pockets that are zipped shut. These are perfect for holding a small needlework project. I love the depth of each pocket. These really will hold items without a problem. I think this would also make a great makeup bag since the pockets are made of vinyl. If I were using it for that purpose, I think I would also make the interior from a laminate so that the entire inside of the pocket could be wiped clean if need be. Well, that's it for the fall collection! 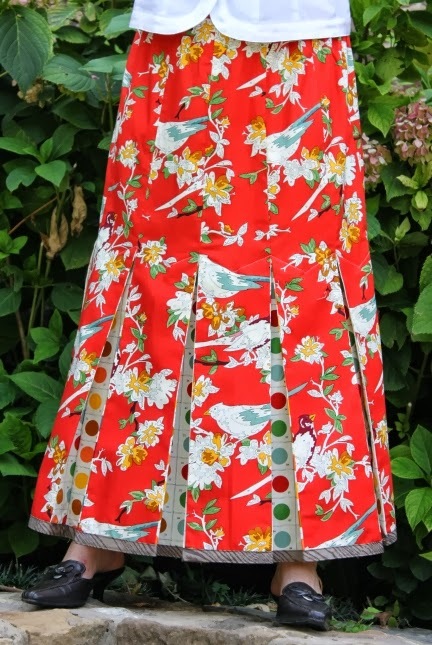 I hope I have inspired you to get busy in your sewing room! 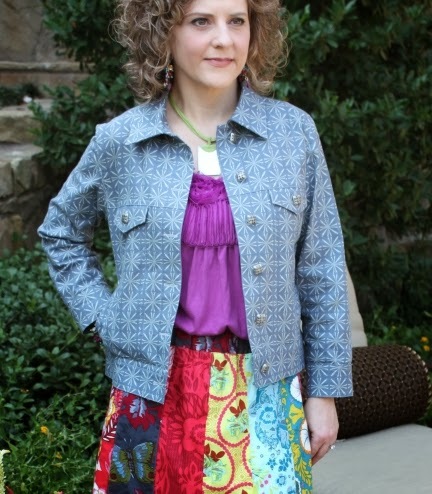 Fall 2013 Collection: Fashion Formula Skirts, Volume 3! various Anna Maria Horner fabrics...scrappy! Well, I just couldn't help myself! 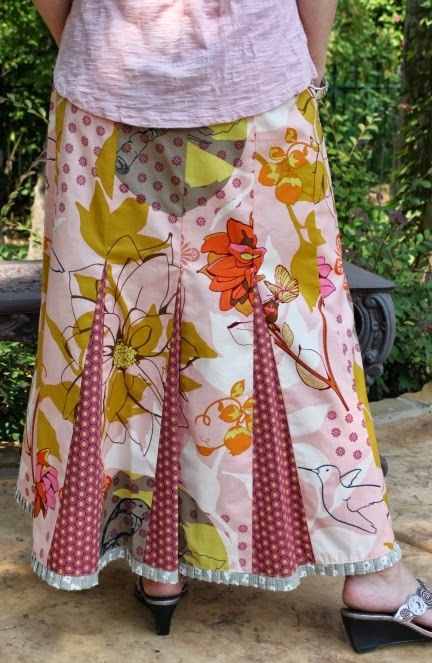 I have designed yet another set of skirts for my Fashion Formula line. This time I decided to do a 12 panel skirt 12 different ways. 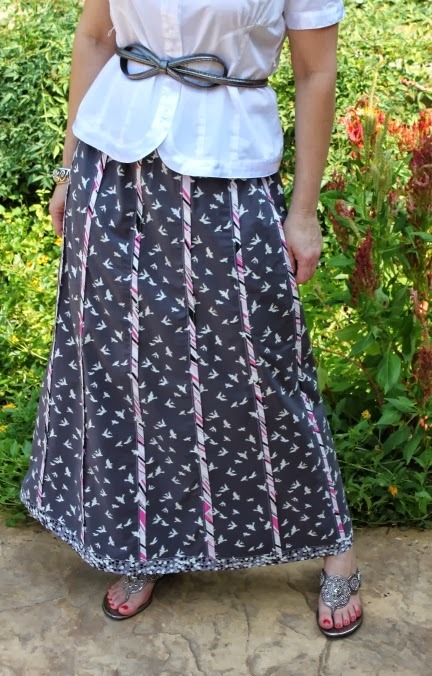 As per the other skirt booklets, you will be basing your skirt from your hip measurement. The booklet gives yardage for hip sizes 34-50. Believe it or not, all of these skirts are created from the same basic 12 panels. The insertion of pleats, godets, or gathered panels makes them look strikingly different. The waistband is a wide casing with one piece of soft elastic in it, so it is easy to insert and very comfortable to wear. I like to have my casing a bit wider than the actual elastic, as I think it lays better against your body as well as being more comfortable. The overall appearance of the casing is pleasing as well and you may find that you don't mind the elastic part being visible. In the photos, you will see that I opted to tuck in my shirt on several of the shots. 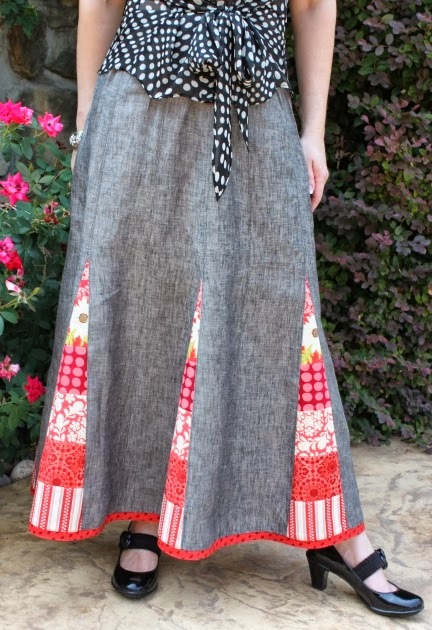 The skirts in the booklet are intended to be long. I give instructions for lengths 32, 34, and 36 for you tall gals! 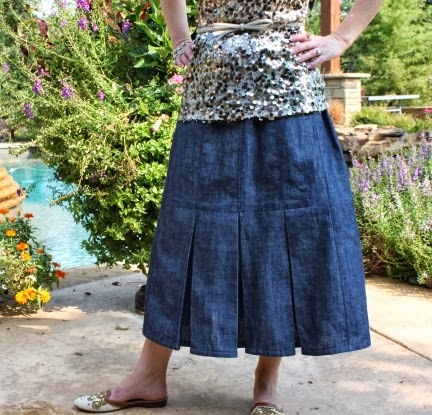 If you want to make a shorter skirt, you can always shorten your panels before tapering them. 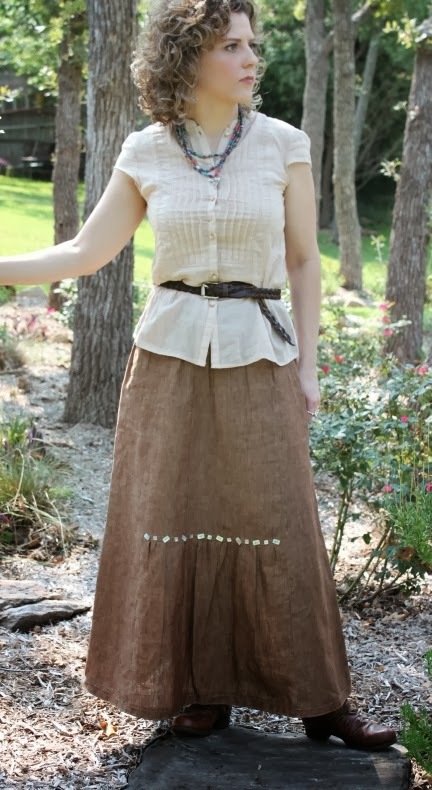 I have placed the skirts into 4 groups: plain, gathered panel, godet, and pleated. Below are the details for each skirt included in the booklet. 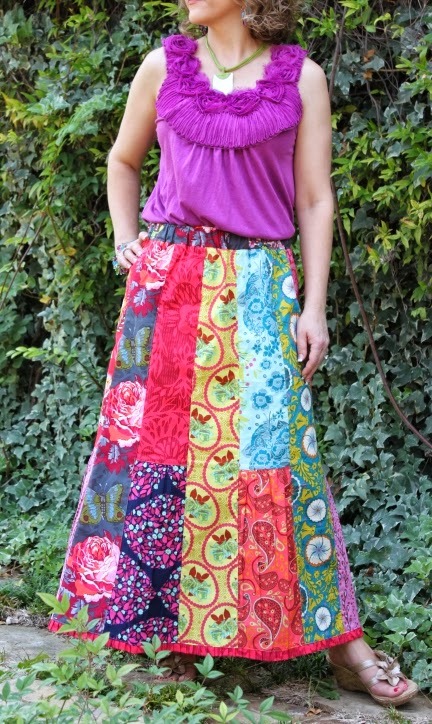 Just think of all the great skirts you can get from one set of simple instructions! The possibilities are endless...truly! Lots and lots of skirts.......have fun with it! Fall 2013 Collection: Meet Jordan! The next reveal is the Jordan Jacket! 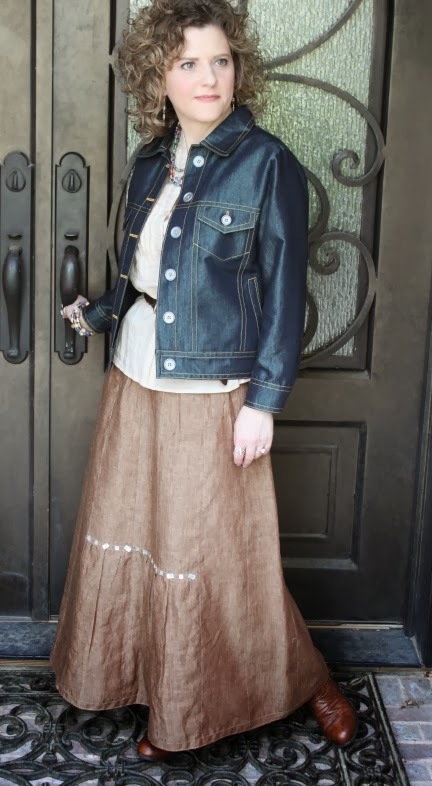 I was noticing how much the classic denim jacket was showing up in fashion these days. 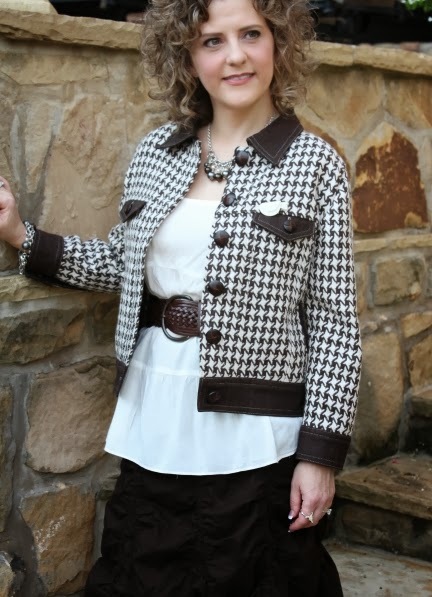 To tell the truth, the style of this particular jacket never goes out of style...it is truly a classic. 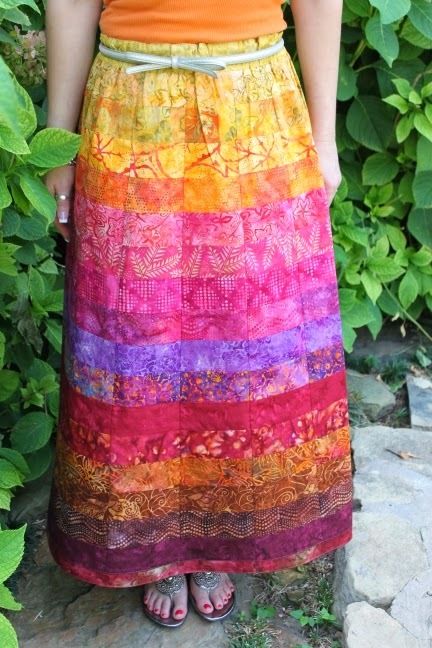 I had some fun with the fabrics on this one and show it to you made up in wool, linen, and cotton sateen. It really is so versatile! You could make it from velveteen or corduroy as well. Even a heavy silk would be fabulous! The details are what make this jacket special. I took special care to give you the set in pockets so many of you said are important to a jacket. I think you will find that the pockets are great for stashing your phone or whatever other small items you may want to carry. The upper pockets are fully functional as well, but of course they are small, which is how it is with these types of jackets. This particular jacket is unlined, so you don't have to worry about messing with another layer of fabric. I also designed it so that there are no facings to deal with either. The front facing is built into the front pattern pieces, so it will be folded around to the wrong side. Don't let all the detailing intimidate you! This jacket does take some time, but the steps are very manageable. I highly recommend that you have a serger handy so that you can finish off your seams neatly. After all, they will be seen on the inside of the jacket. I think the choice of buttons for this jacket is very important. For most of the ones seen here, I chose vintage buttons from my personal stash....I'm a bit of a button hoarder! As with all of my patterns, how much detail you decide to add is your choice. If you don't want to do some of the pockets, you can always opt to leave them out. I encourage you to make the pattern uniquely yours. Here are some images of the different jackets I made along with some fabric details. 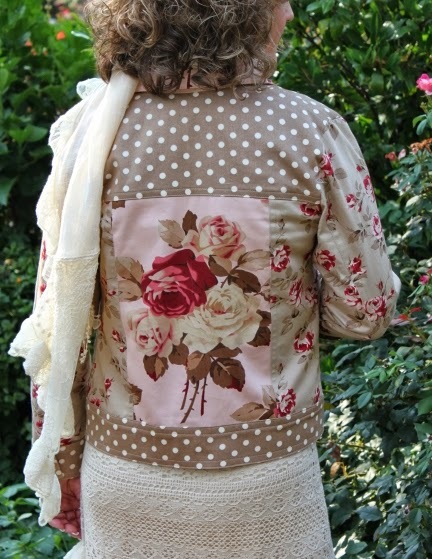 Here's the back of the jacket. Notice how I fussy cut the fabric to showcase the motif. So, there's the Jordan Jacket! Again, we will have this pattern and the rest of the new items up on the website later on this week. Fall 2013 Collection: Meet Ramona! It has been busy, busy here at Casa Serendipity. In addition to creating the new fall line, I went to Denver last week to tape with Ellen March for a spring 2014 show of Sew it All. This is a great sewing show that airs on PBS. 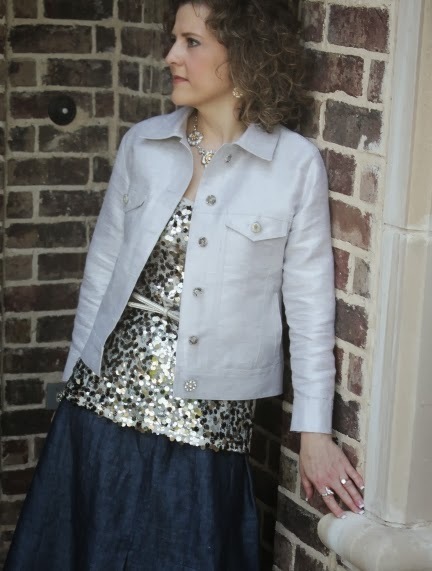 I was asked to write an article about working with lace and specialty fabrics for Sew News, so I designed a great party dress using these fabrics and we show the construction and discuss helpful tips on the show. As we get closer to air date, I'll be sure to keep you all updated. 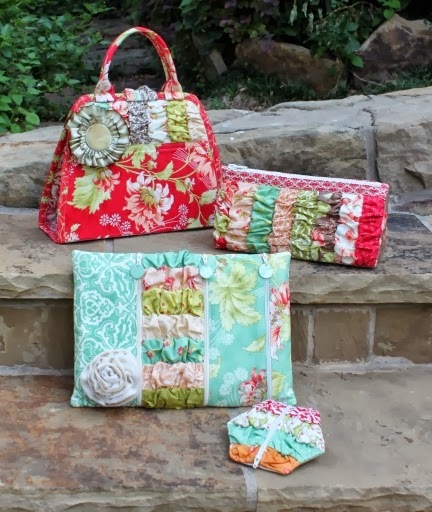 In addition to that, I'll be at the Original Sewing Expo show in Fort Worth this weekend, starting on Thursday. There will be two fashion shows highlighting my designs, one on Thursday at 2:30, and another on Saturday at 1:45. This is the WEEKEND BEFORE MARKET, people! I guess no one really looked at that part of the calendar of events...this is the craziest time of the year for me and lots of other designers! Having said that, I will be at the show ONLY on Thursday to emcee the fashion show, then I'll be in my friend Lorene's booth (Sew it Up Studio) to sign books and talk to folks. Please stop by if you will be at the show and say hello. I would love to see you! The last weekend of the month will be market in Houston, as it always is. I think we are nearing our 20th market. It is hard to believe we have been doing these shows for so long. I still get so excited and energized at these shows! There is so much to see and so many good friends to visit with...lots to look forward to. Then, the holidays will be just around the corner. Where did the year go? I am sure many of you are asking the same question. Well, enough of my nonsense, you came to see the new stuff, right? Well, there will be 4 new designs revealed, so this is part one. The new inventory is expected TODAY, so we'll be busy getting these listed on the website this week so you can get those orders rolling in. I am excited about this new collection and hope you will be as well. We did the photos mid-September at my brother-in-law's lovely home in Southlake. He is quite the landscaper and does all the work himself. It is beautifu1! We feel very lucky that they gave us free run of the place to do the photography. We felt like we were at a resort! Now if we just hadn't had to work so darn hard! 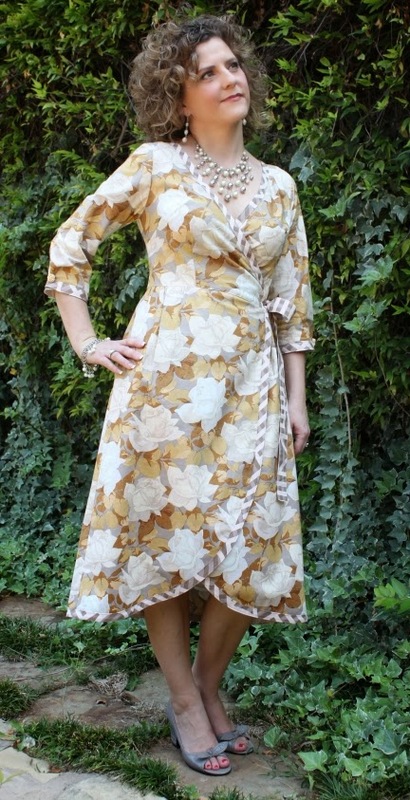 The first design I want to share with you is the Ramona Wrap Dress. This is a super quick design to stitch up. There are only 5 pattern pieces and NO facings, zippers, or buttons! Can you believe it? The edge of the dress is finished off with a bias binding. 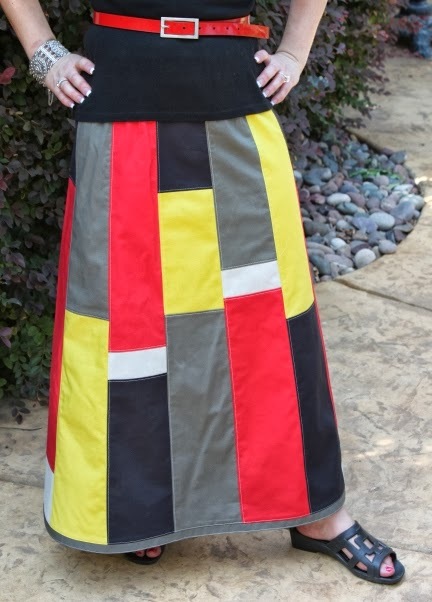 I have also given you some options with the length of the skirt and sleeves as well as ideas for adding a contrasting fabric to the front of the skirt. I love this dress! It came out just as I intended. It is perfect for any time of year and I really love wearing my fall dresses with riding boots...the HOT fashion item of the season. I think the real reason I love those boots so much is that they are not high heeled! My feet have gotten so used to being bare that they simply refuse much of a heel. 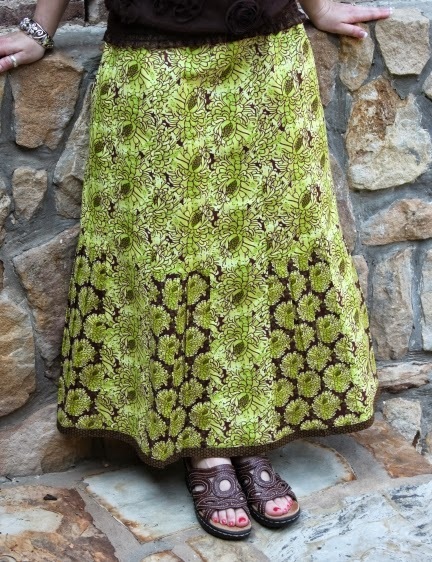 Here are some images of the new dress....and the details on the fabrics I used. So there you have it! The first design for Fall 2013. The rest of the reveals will be coming this week. We will have these available for sale later on this week. Stay tuned!